Bray currently sit bottom of the Premier Division with three wins in 24 games. 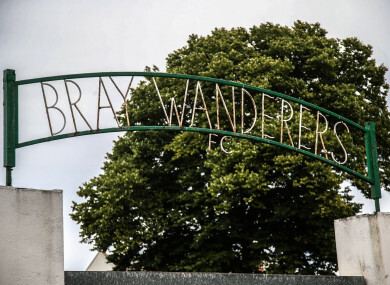 BRAY WANDERERS HAVE announced they are willing to listen to offers for all of their current players, as the League of Ireland club faces into yet another crisis. The Seagulls were marred by controversy all throughout last season and currently sit bottom of the Premier Division with just three wins from 24 games so far in 2018. “Bray Wanderers have reluctantly decided to listen to offers for any of their players,” the club said in a statement released by chairman Gerry Mulvey on Tuesday. “Given the club’s inability to guarantee wages until the end of the season, it’s only fair to give the players an opportunity to secure employment elsewhere. Bray Wanderers have reluctantly decided to listen to offers for any of their players. Given the club's inability to guarantee wages until the end of the season, it's only fair to give the players an opportunity to secure employment elsewhere. Email “'Inability to guarantee wages' sees Bray Wanderers willing to sell first team players”. Feedback on “'Inability to guarantee wages' sees Bray Wanderers willing to sell first team players”.